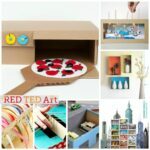 Cereal Box Crafts are great, as it is another household item that many have in abundance (well, not all.. I had to pinch a couple from my neighbour, but still a common enough item). 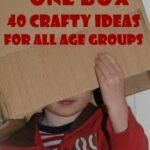 The card is smooth and flexible and if you make use of the existing “box” there are many cereal box crafts you can explore. 1) Again, first up, we shared our Shadow Puppet – not only is it fun to make – but the kids LOVE exploring shadows. 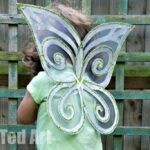 Use tissue paper and make it colourful fun too! 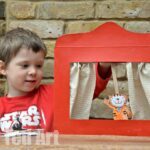 2) I also shared our latest craft idea – the cereal box box frame – for storing AND displaying your kids artwork. 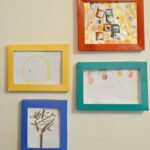 Super easy to make and look great on your wall. AND you get to store all those drawings! 3) Playful Learners shared their Golden Eagle theatre – I love how it was supposed to be a fish tank but that the kids had other ideas and added trees made from sticks as part of the background. Lovely. 4) Plus 2 Point 4 shares a great “classic” – the cereal box weaving loom – quickly made and great for giving weaving ago. (Blog post to follow). 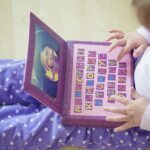 5) Next up Me and My Shadow create a fun little “hidy box” – turn your cereal box into a book and hide away your treasures. 6) Kids Chaos continues to be green and pulps the boxes to turn them into seedling pots! Genius. (Blog post to follow). 7) I love these colourful drawer dividers from I heart organising. Another simple and yet effective idea and one that my craft drawers really would benefit from. 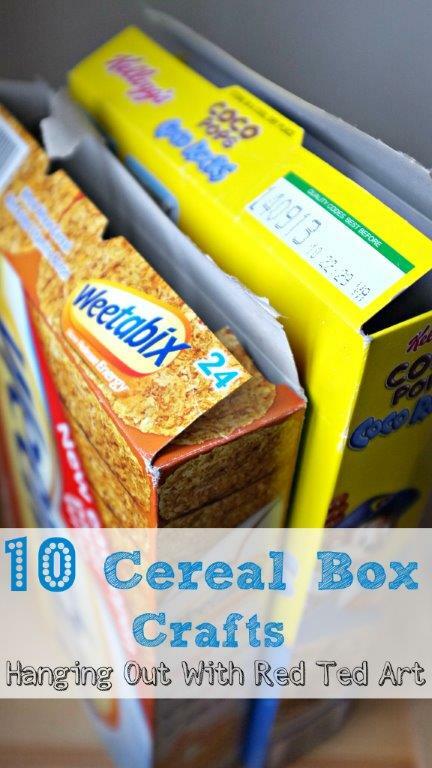 8) Next up I love these cereal box containers – cereal box cardboard is perfect for weaving and make a fun little recycled craft. 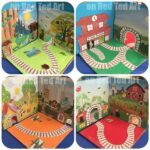 9) I love the cereal box village made by Handmade by Charlotte – again colourful and fun! 10) And finally I think Chef Tess Bakeresse’s Pinata is genius! I will be making one for sure! 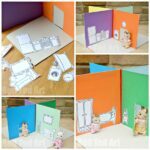 11) A sneaky EXTRA one.. we made a fun fun fun FOLDABLE take along dolls house! Simply fab.